With Single Touch Payroll (STP) set to become mandatory for all employers in a matter of months, practitioners may find some small business clients have a few questions. Here are the latest developments. As has been reported here before, STP is the government initiative aimed at streamlining employer payroll reporting obligations. The STP regime revolutionises the way employers report payroll information to the ATO. In essence, STP is a new reporting mechanism whereby each time an employer pays its employees, the employer will also send the ATO their payroll data (such as salary, wages, and/or allowances paid, and the PAYG withholding on these payments) from their payroll software. This is done through an “STP pay event” (which is each weekly, fortnightly or other pay cycle). On the superannuation front under STP, employers will continue to report and pay their employees’ superannuation entitlements through their existing SuperStream solution (including via the ATO’s Small Business Superannuation Clearing House). What will change however, is the requirement to report employees’ super liability or ordinary time earnings (OTE) each pay day. This is based on the amounts employers currently provide on an employees’ payslip. While large employers have been reporting via STP since 1 July 2018, smaller employers (less than 20 employees) have until 1 July 2019 to be STP-compliant. And note that the legislation to extend STP to smaller employers has just passed into law. Now the legislation has passed, it is estimated that there will be more than 700,000 employers who will need to be STP-compliant by the 1 July 2019 start date. The ATO is recommending that these smaller employers join the almost 15,000 other smaller employers who have already voluntarily opted-in early to STP. The ATO acknowledges that there are a significant number of smaller employers who do not use any type of payroll software when processing their pays each week/fortnight etc. Consequently, micro businesses (employers with 1 to 4 employees) will not be required to adopt/buy payroll software in order to comply with STP reporting. Rather, the ATO is working with payroll providers to develop various affordable, alternative solutions (costing less than $10 per month) which may include mobile apps, and portals. 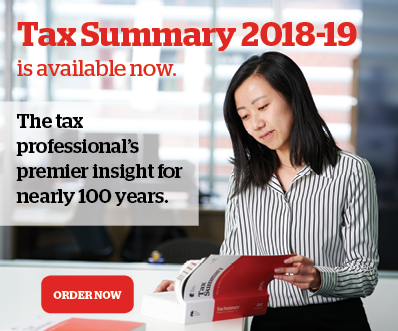 Even the legislation has now passed, and smaller employers are required to comply with STP from 1 July 2019, the ATO has indicated that it will be flexible with the commencement date, including the provision of deferrals to help stagger the uptake. 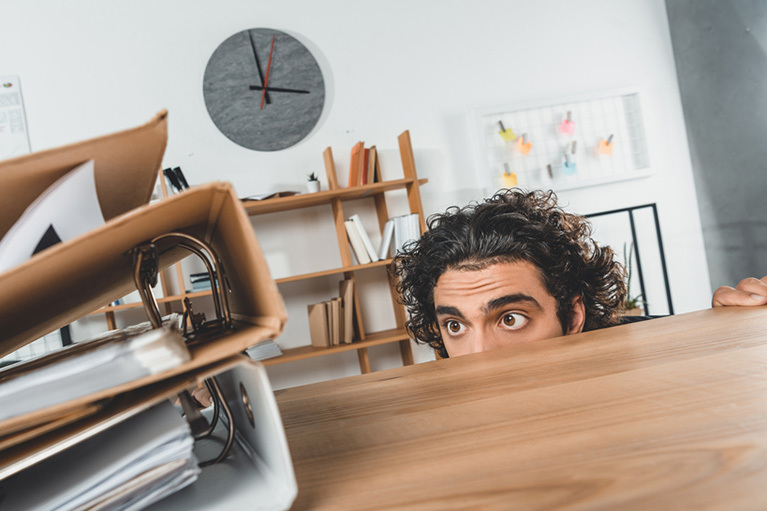 Importantly, from a compliance standpoint, the ATO states that employers need not be concerned about penalties for the first 12 months after the 1 July 2019 commencement date, as the primary aim is to help employers get the new system bedded down. 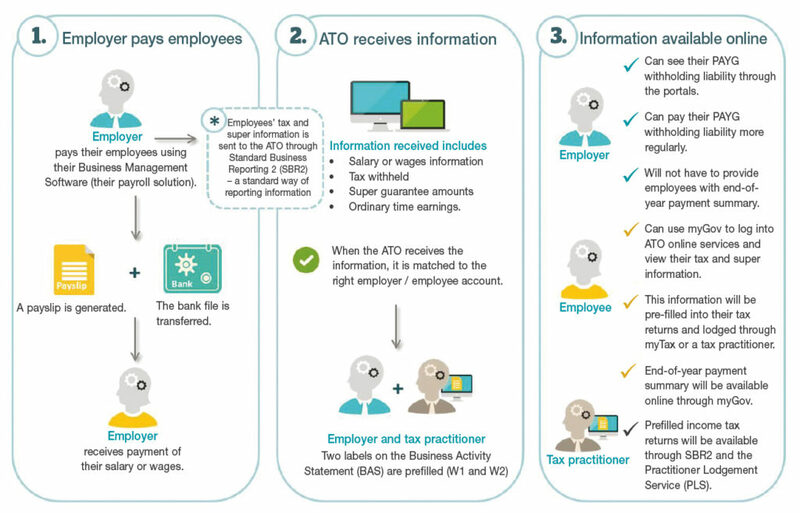 The following shows how STP will work, and has been provided by the ATO. To download this infographic on a Word document that you can provide to your clients, click here. A fuller treatment and more information on this topic can be found in the February issue of The Taxpayer magazine, including the advantages for employers of STP and the types of businesses that may qualify for an exemption from STP reporting. Tax & Super Australia members receive this magazine as a member benefit. The Taxpayer online is generally available to members from the beginning of each month, and the print version is mailed one week to 10 days later.